Top 10 Rich Chocolate Brown Comforters for a Luscious Bedroom! 10 Beautiful Chocolate Brown Comforters and Bedding Sets for a Warm Bedroom! I love chocolate brown bedding! It has the power to bring immediate warmth to any bedroom! It is also associated with wood, chocolate and delicious coffee! I gathered here my top favorite chocolate brown comforter sets and bedding sets being sold online! Very Affordable 7 Piece Jacquard Striped Brown Comforter Set for Sale! This luscious mocha brown color comforter set got my attention right away! Makes you want to grab a cup of latte or mocha coffee…. I love it how they also got matching cute mocha brown lamps to make the whole bedroom look like dark chocolate! You will also get the mocha pillow shams, pillow cases and the cute brown cushions! Cheapest Chocolate Brown Comforter Set! 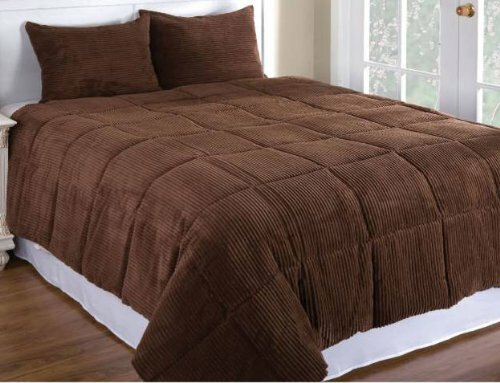 This is one of the cheapest chocolate brown color comforter being sold! It is very, very soft and it is made from a special fiber which is allergy free! Beautiful White Tree Branches Design Bed in a Bag Chocolate Brown Comforter Set! This is also among my top favorite brown comforters! I love this cool white tree branches design against the warm chocolate color background! It is also reversible to white color with brown tree branches on it! 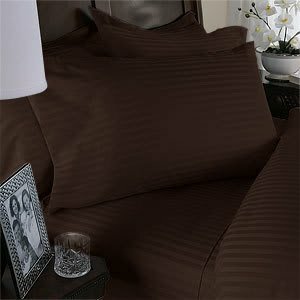 This is a luxurious looking chocolate brown silk duvet cover set for sale! Look at that silky shine! This is a beautiful and very elegant 7-piece coffee brown color king size comforter set for sale! You can wash it in your machine using cold water. Gorgeous dark chocolate brown ruffled style comforter set for sale! Will make your bedroom look very elegant and romantic…. It also comes with the beautiful dark chocolate color cushions and pillows too! This beautiful microplush corduroy comforter set looks just like a huge chocolate bar! What a beautiful and very elegant 8-piece 600tc Egyptian cotton solid dark chocolate brown bedding set for sale! Will definitely make your bedroom look like an upscale hotel room! It also comes with the beautiful dark brown pillow shams, pillow cases and bed sheets! 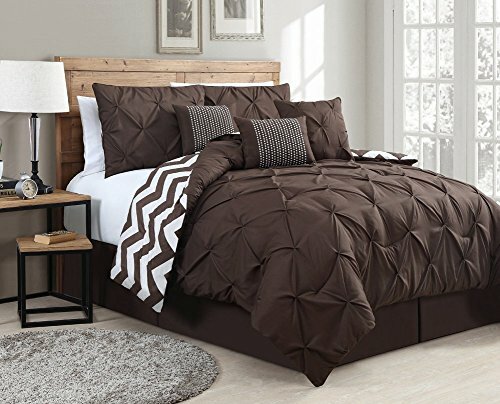 This is a very affordable and very elegant looking 7-piece chocolate brown comforter set in a very cool design! It also comes with the bed skirt and the three decorative pillows to complement the look!